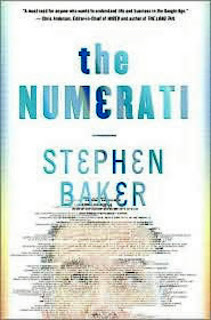 In The Numerati author Stephen Baker tells us that we are slowly being reduced to algorithms which will make it easier for business, government and even the medical field to target us in the future. With the help of powerful computers, the Numerati, - mathematicians, computer experts and analysts are digging into our data and slowly creating a mathematical model of humans. Baker divided his book into seven chapters. In each chapter, he explained how this model could help employers optimize their workforce, advertisers to put the right ads on our emails, help government identify terrorists, make political campaigning more effective, and help medical practitioners identify people with Parkinson's even before the onset of the disease. In the last chapter, Baker and his wife acted as guinea pigs to an online matching company. Our online behavior is a rich source of data, according to Baker. Every click we make on Internet sites, every email we send and membership to social networking sites will enable the numerati to put us into "buckets" or categories and make us even more identifiable by those who wanted to make us their audience. Even as I write this blog, there is a possibility that some data miner is already scrutinizing my past entries bit by bit. In another chapter of the book, Baker reveals how our data will be obtained in the future. Medical scientists are already trying out magic carpets and walls that monitor subtle changes in the way we walk, talk and move in bed to identify signs of sickness. We could even end up like the cows in one form where microchips are implanted in their guts to identify them in case they produce bad meat. While the book expounded on how our data are gathered and the many possible uses of the algorithms that can be made out of them, it did not fully explain how the numerati go about their tasks in transforming our data into mathematical models. Perhaps, Baker assumed the process would be too complex or even intimidating for the average reader. Another reason I could think of is that maybe Baker thought that one whole chapter on this process would slow down his narrative. However, anybody interested in math and wants to know more about the subject matter of modelling will be frustrated that the book didn't have that much information. All he could tell us is that data are fed into a computer which does all the computation following the set of instructions given by the computer programmer. Then numerati then looks at the computations and draw conclusions. In the conclusion of the book though, Baker readily admits that there is still a long way to go before a mathematical model of ourselves could be developed. Human behavior is so complex that scientists are still unable to fully grasp it in spite centuries of studies. I think I agree with him that in the end, it will be us who will determine who we really are and whether or not this elite group of mathematicians really get us right.